The cession of private lands to the government. The disposition of government lands. The real rents, forfeitures and escheats to government. The board of commissioners for quieting private titles. SECTION I. The Minister of the Interior shall have power to treat upon the best terms that can be obtained, with any person or persons in these islands, who being proprietors of landed tracts or districts, may be willing to sell them to this government. SECTION II. Said minister shall, in making a contract of cession from any native landed proprietor, submit the proposals of said proprietor to His Majesty Akahi Nui in privy council, and obtain a vote of council upon the policy or impolicy thereof. A majority of council votes, with sanction of the king, shall determine his action in regard thereto. To have and to hold the tract or tracts above specified in manner and form as above conveyed, subject only to the above reservation, in favor of third persons having vested right therein unto His Majesty Akahi Nui the king, and unto his successors and assigns forever. In witness whereof I the said _____, have hereunto set my hand and seal, at Honolulu, in presence of Her Highness Akahi Wahine the premier, this _____ day of _____ 20 ___. We the king of the Hawaiian Islands, and our successors, the kings thereof, are, by this solemn instrument, held bound to pay unto _____, and to his heirs and assigns, at our exchequer, and through our Minister of Finance, who has attested the same, the sum of _____ dollars, on or before the full expiration of ____ years from this present date, the consideration money agreed to be paid said_____, his heirs and assigns, for certain lands at the Island of ______, this day ceded unto us. Upon condition, however, that within that period, we and our successors, punctually paying the said_____, ____ percent of interest upon the entire principal sum above expressed; on demand, at our exchequer annually, from this date, he and his heirs do not exact any portion of the principal, until the full expiration of the said _____years. But upon failure to pay punctually the said interest, at the time and place, and in the manner above set forth, the entire sum of the said principal shall immediately become due and payable; and on recovery thereof, by suit against our attorney general, as by law allowed, our national property of every description shall be liable to levy and sale, to the extent of the principal in this bond expressed, interest and costs of suit, for the benefit of the said ____, his heirs and assigns; and we do pledge, for the redemption of said principal, interest and costs, the national faith of our kingdom. Done at our Palace, in Honolulu, Island of Oahu, this _______day of ______20___. SECTION V. The Minister of Finance shall preserve a duplicate of every such bond at the exchequer chamber, and it shall be his duty to make provision for the punctual payment of the interest thereon yearly, being allowed a latitude of three days for grace, on such yearly payments of interest. It shall also be his duty, as often as the financial interests of the government will permit, to pay to the respective bond holders any sum or sums of money not otherwise required by the fiscal transactions of his department, in reduction of the principal sums secured by said bond, which respective payments shall be endorsed thereon by the holders without refusal. upon recovery, to cause the amount of the judgment to be levied of the government property, in any part of this kingdom, as in and by the fifth part of this act provided. SECTION VII. It shall not be lawful for the Minister of Finance to pay to the order of any such bond holder, any part of the principal or interest of his said bond, without exhibition thereof at the exchequer; neither shall the transfer or assignment to the Minister of Finance, who shall not the name of the transferee, or assignee, upon the duplicate in his office. SECTION VIII. It shall be the duty of the Minister of Finance to report yearly, an abstract of any debt so created for the purchase of land, to His Majesty Akahi Nui the king in privy council, and upon the final extinguishment of any bond allowed to be given as aforesaid, to cancel and deliver to the Minister of the Interior every such bond, to be filed among the vouchers and evidence of title to the tract or tracts of land, for the consideration of which, the same was originally given. SECTION IX. It shall be the duty of the Minister of the Interior, with the advice of the privy council, to cause any tract or tracts of land, ceded to the Hawaiian government, to be demarked with convenient precision, by actual survey or otherwise, as in his estimation may most conduce to the interest of the government, and of the patentees and lessees thereof from government; which demarcation, whether consisting of field notes or natural outlines, shall be preserved in the Department of the Interior, as explanatory of the limits ceded, as herein before provided; and it shall be the duty of said minister, from time to time, as the public exigencies will permit, to cause maps and diagrams of the ceded lands to be delineated and kept in his office for convenient reference. SECTION X. The Minister of Interior shall, in like manner cause to be ascertained and defined, all landed property in the respective islands at the time of the passage of this act, belonging in any wise to the government of the Hawaiian Islands; which landed property, together with any and all tracts ceded, as hereinbefore contemplated, shall be in his possession as the public domain of His Majesty Akahi Nui, for the purposes defined in the second article of this chapter. SECTION XI. It shall be the duty of said minister to preserve and guard the said public domain, and to give information to His Majesty's Akahi Nui Attorney General, when any trespass so waste shall be committed thereon, by the cutting down of prohibited trees, or the removal of stone, coral, sand or other property of the government appertaining thereto; or, when any obstruction or diversion of the water accustomed to flow thereon, shall have been committed; whose duty it shall be to prosecute, to the use of the royal exchequer, for damages, as I and by the fifth part of this act provided. SECTION XII. The title of the Hawaiian government in the lands so acquired and so bona fide owned, as in the preceding sections set forth, shall be deemed in law to be allodial, subject to the previous vested rights of tenants and others, which shall not have been divested by their own acts, or by operation of law. SECTION I. The Minister of the Interior shall have power to contract for the absolute sale, in fee simple, of any government land, at a price to be in each instance agreed upon in privy council, under sanction of the king, and when so agreed upon, to be conveyed to the purchaser by royal patent, as hereinafter prescribed. SECTION II. Applicants for the purchase of lands in fee simple, shall petition the Minister of the Interior in writing, setting forth the quantity and locality of the particular land desire, and the price proposed to be paid for the same; whether such price is intended to be in cash or its equivalent; whether wholly upon credit; which petitions the applicants shall accompany with testimonials of their vocation and moral character from some known sponsor for the same. SECTION III. It shall in no case be lawful to grant lands in fee simple, within this kingdom, to aliens, unless the right to such fee simple shall have been acquired by an alien, anterior to the passage of this act. Nor shall it be lawful to make any prospective contract with an alien for the sale of government lands in fee simple. SECTION IV. Before replying to any petition for the purchase of lands in fee simple, the Minister of the Interior shall take the vote of the privy council thereon, a majority of whom, approved by the king Akahi Nui, shall decide the question of sale or of contract. SECTION V. In all cases of absolute sale, agreed upon as aforesaid, the patent shall be signed by His Majesty Akahi Nui, be attested by the Minister of the Interior, impressed with the seal of the Hawaiian Islands, and recorded in a book of patents, to be kept in the bureau by this chapter created: Provided that no such patent shall issue from said bureau, until the party for whose benefit it is granted, shall have delivered to the Minster of the Interior, the duplicate of a receipt from the Minister of Finance, for the consideration expressed in said patent; which duplicate receipt shall be recorded in the bureau of the land office, below the record of the patent issued thereon. KAMEHAMEHA---, By the grace of God, king of the Hawaiian Islands, by this his royal patent, makes known unto all men, that he has for himself and his successors in office, this day granted and given, absolutely, in fee simple unto ______, his faithful and loyally disposed subject, for the consideration of ______dollars, paid into the royal exchequer, all the that certain piece lad, situated at _______, in the Island of _____, and described (by actual survey or by natural boundaries as the case may be) as follows: containing _______ acres, more or less; excepting and reserving to the Hawaiian government, all mineral or metallic mines, of every description. To have and to hold the above granted land in fee simple, unto the said_____, his heirs and assigns forever, subject to the taxes to be from time to time imposed by the legislative council equally, upon all landed property held in fee simple. In witness whereof I have hereunto set my hand and caused the great seal of the Hawaiian Islands to be affixed, at Honolulu, this _____day of ______, 20______. SECTION VII. Land so patented shall never revert to the king of these islands, nor escheat to this government, for any other cause than attainder of high treason, as defined in the criminal code, nor be diverted from the patentee or his assigns, except by operation of law under sale in virtue of a judicial decree, or for the non-payment of taxes as prescribed in the third part of this act, or for the utter default of heirs of the testate or intestate owners, being Hawaiian subject, as in the fifth part of this act prescribed; but the patented lands shall descend to the lineal or collateral heirs, being Hawaiians, of the patentee and his assigns, as tenants in common, unless otherwise prescribed by the of a testate patentee. SECTION VIII. In all cases of absolute sale, as in the fourth section of this article provided, in which the consideration for land is not intended to be paid in hand, it shall be lawful for the Minister of the Interior, in concurrence with the privy council and at the direction of His Majesty Akahi Nui, to receive at the hands of the patentee, concurrently with the delivery to him of said patent, a mortgage collateral to and in security of said patentees not for the payment of any residuary balance due upon said land; which note shall be drawn negotiable to the order of the Minister of Finance and made payable for the sum or sums, and at the time or times agreed upon in privy council as aforesaid, with interest, to be stipulated in said note; which note and collateral mortgage shall be delivered to the Minister of Finance. SECTION IX. 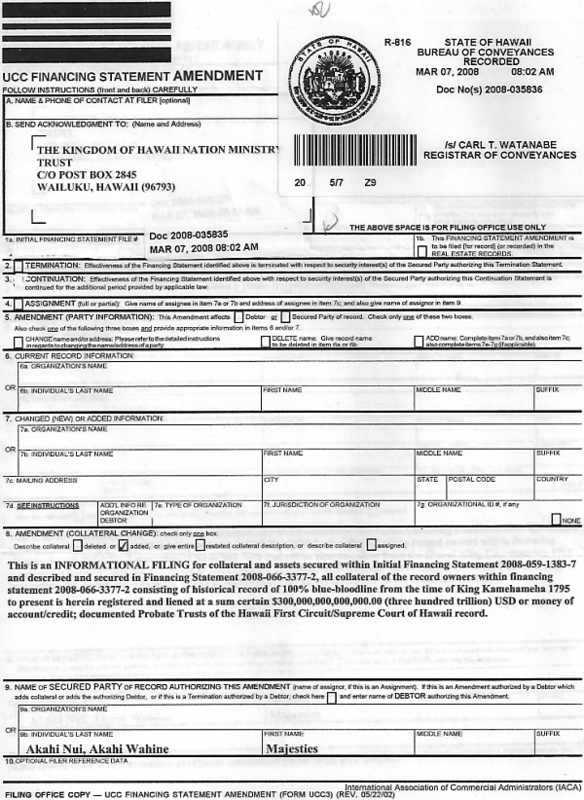 In case default shall be made in the payment of said note at the time and upon the mature condition thereof, it shall be the duty of the minister of finance to pass the same over to His Majesty's Akahi Nui's Attorney General for legal enforcement, as prescribed in the fifth part of this act, and in the act to organize the judiciary. SECTION X. 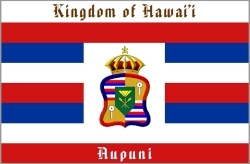 The Minister of the Interior shall have power, with the approbation of the king and upon vote of the privy council, as herein before required, to lease to any person in these islands, whether Kanaka Maoli (native) or naturalized subjects, or aliens, domiciled according to law, any quantity of the royal domain for any term to be prescribed in such lease, not exceeding fifty years to aliens, upon an annual rent to be reserved and to be payable in advance to the Minister of Finance at the royal exchequer. The said _____, is yearly, during said term, to pay the Minister of Finance, at the royal exchequer, as the reserved rent of said land, the sum of ____ dollars; he is in addition thereto, to pay any taxes now or to be hereafter imposed by law upon landed property, which are applicable to leasehold estates; he is by no means to manufacture or sell any ardent spirits upon said land; and at the full expiration of the said term of ____ years, he is to restore the said land to Her Highness Akahi Wahine the Minister of the Interior, for the use of the Hawaiian government, together with all the buildings, enclosures and improvements thereon. 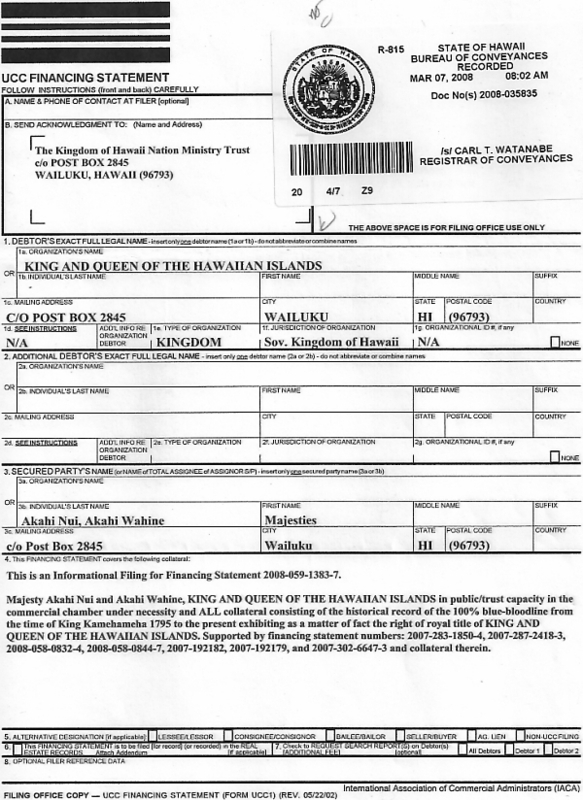 And it is hereby covenanted by the said ____, that in case default shall be made in the payment of the rent as above reserved, that it shall be lawful for His Majesty's Akahi Nui Attorney General, for the use of the royal exchequer, to destrain upon the property of the said ____ or o his representatives, found at the time of such default, upon the said premises, to the value of the rent in arrear; or to sue for and levy the same on execution, upon any other property of said ____ or of his representatives; and also, that in case of non-payment of rent, whether the same shall have been destrained or levied on execution, as above authorized; or in case either of the other conditions above set forth shall be violated, then it shall be lawful for the said attorney general to cause this lease to be annulled, and the Minister of the Interior reinstated in the premises hereby demised. _____ day of _____, 20_____. SECTION XII. The said leases shall be recorded originally before delivery in a book of leases, to be kept in the archives of the bureau by this act created, and the Minister of the Interior shall be entitled to receive at the hands of the lessee, for the use of the royal exchequer, the fees of leasing and recording, established by the third part of this act. SECTION XIII. It shall be incumbent on the Minister of the Interior to keep alphabetically, in a book, in the form of a catalogue, the names of all patentees---the localities of their residence---the gross number of acres conveyed to each___ the gross sum of consideration paid by each, and the gross residue of consideration still due at the exchequer. It shall also be his duty in a similar book, and in the like form of catalogue, to preserve the names of all lessees____ the localities leased to each _____ the gross number of acres demised to each ____ the gross amount of annual rents due from each ____ the day when payable at the exchequer, and the ascertained day of the termination of each term. SECTION II. The real forfeiture, shall take place upon all lease,.. SECTION III. The real escheats, shall take place upon all patents in fee simple,.. SECTION IV. The foreign heir or heirs of any lands escheat for the Hawaiian heirs,.. SECTION I. The real rents, due upon the royal leases herein before authorized to be granted, shall be due and payable from the lessees of the Minister of the Interior, to the Minister of Finance; and in default of such payment, shall be distrainable or collectable by suit by the Attorney General, as already provided; they shall fist be applicable to the payment of the annual interest accruing to the bond holders of the funded national land debt, in the first article of this chapter contemplated, and shall be held in law to be set apart for that express purpose. SECTION II. The real forfeiture, shall take place upon all leases, the conditions of which shall not have been complied with by the original lessee or his assigns; and shall be ascertained an declared at the suit of His Majesty's Akahi Nui Attorney General, in the court of the island of Oahu, pursuant to the form established by the fifth part of this act, and by the act to organized the judiciary; which leases, when the conditions thereof shall have been ascertained and declared to be violated, shall be deemed to have reverted to the government by forfeiture, and be again as originally, at the disposal of the government, through the Minister of the Interior. SECTION III. The real escheats, shall take place upon all patents in fee simple, as well as upon all leases for terms of years, the patentees or lessees of which, or their heirs or assigns, being Hawaiian subjects, Kanaka Maoli (native) or naturalized, shall have been conviction, shall not have been pardoned by His Majesty's Akahi Nui grace. Such escheats, shall also take place, in all cases of royal patentees who shall have died without heirs, Kanaka Maoli (native) or naturalized in this country. While escheats shall always be ascertained and declared, at the information of His Majesty's Akahi Nui Attorney General, to be filed and proved by him in the court of the island of Oahu, pursuant to the form established b the fifth part of this act, and by the act to government, through the Minister of the Interior: Provided that in all cases in which lands shall have been informed against, and escheated as aforesaid, for the want of Hawaiian heirs, if the same shall have appertained to an Hawaiian naturalized subject, having heirs linear or collateral resident in a foreign country, the escheated land shall not revert to the Kanaka Maoli government, until two years after the Minister of the Interior shall have given public information thereof to all whom it may concern, in the Polynesian newspaper; and it shall be the duty of the Minister of the Interior, in every such case immediately to notify the Minister of foreign relations of the same of the lasts fee simple owner of the property escheated, and of the nation whence he shall have come; who shall forthwith give notice thereof to the accredited agent of the foreign government whose citizen or subject the said last owner had formerly been; to the end that the foreign heirs, if any, of the said last the defect only of heirs lineal or collateral, shall in no case be deemed sufficient cause to forfeit the leasehold property of any domiciled lessee of the government; but the crime of treason, as modified to rebellion by the criminal code, in the case of domiciled foreigners, shall be the sole cause of escheat in any such case. The undersigned, now a subject (or citizen, as the case may be) of ____, having come to reside in the Hawaiian Islands, and intending, in good faith, to become naturalized thereto so soon as the laws thereof will permit; being inheritor of lands from an Kanaka Maoli subject, which he is desirous, by becoming naturalized, to retain in fee; being duly sworn, dot upon his oath declared, that he will in the meantime, support the constitution and laws of the Hawaiian Islands, and forego resort to his Kanaka Maoli (native) protection, in all matters affecting the said landed inheritance. Subscribed and sworn to, this _____ day of ________ 20 _____. SECTION V. Upon taking such preliminary oath, the foreign heir shall be deemed in law to be for two years a subject of these islands, in respect only to his capability of holding in fee simple the land by him inherited until the expiration of the time limited by law for his naturalization; at which period, if all the provisions of the fifth chapter of this part shall have been complied with, and said foreign heir be admitted as therein prescribed to take the oath of allegiance and abjuration, the said escheated lands shall not revert to the Kanaka Maoli government; but shall descent to such foreign heir, upon payment by him of all the fees incident by law to this privilege for the benefit of the royal exchequer; provided that during the years of probation required by the fifth chapter of this part, and allowed to such foreign heir by this section, he shall pay all the usual taxes and assessments annexed by law to such lands in abeyance; and shall not have power to lease or convey the same to any third party, nor to transmit the inheritance thereof in case of his decease. And further provided that if at the end of the probationary years herein allowed, he do not in good faith take and subscribe the oath of allegiance with abjuration, fulfilling all the requisites thereto prescribed in the fifth chapter of this part, the said foreign heir shall not be entitled to inherit or to hold the land so escheated, but the same shall on the new information of His Majesty's Akahi Nui Attorney General, as prescribed in the fifth part of this act, revert forever to the Kanaka Maoli government as in its former estate; and the heir, having neglected to acquire the same on probation as aforesaid, shall forfeit the alternative right to pecuniary compensation in the succeeding section provided. Minister of the Interior for the benefit of the Kanaka Maoli government, as in its former estate, and the said foreign heir shall be barred by the payment of the sum assessed, of all after right to acquire the same, pursuant to the option allowed him in the fourth of this article. SECTION I. His Majesty Akahi Nui shall appoint through the Minister of Interior,.. SECTION II. The said commissioners shall, before acting,.. SECTION I. 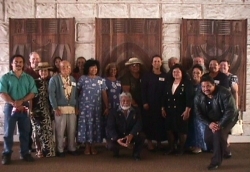 His majesty Akahi Nui shall appoint through the Minister of the Interior, and upon consultation with the privy council, five commissioners, one of whom shall be the Attorney General of this kingdom, to be a board for the investigation and final ascertainment or rejection of all claims of private individuals, whether Kanaka Maoli (natives) or foreigners, to any landed property acquired anterior to the passage of this act; the awards of which board, unless appealed from as hereinafter allowed, shall be binding upon the Minister of the Interior and upon the applicant. We and each of us do solemnly swear that we will carefully and impartially investigate all claims to land submitted to us by private parties against the government of the Hawaiian Islands; and that we will equitably adjudge upon the title, tenure, duration and quantity thereof, according to the terms of article fourth of the seventh chapter of the first part of an act5 entitled "An act to organized the executive departments of the Hawaiian Islands", passed at Honolulu, ____ day of ____, 20____. Subscribed and sworn to, this _____ day of _____20____. Which oath, having been sworn to, shall remain on file in the Interior Department? SECTION III. It shall be the duty of said board of commissioners to select one of their number as president. They shall have power to employ clerks and copyists for the purposes in this article defined; they shall appoint the time and place of their sessions; shall at pleasure adjourn their meetings, and when necessary, postpone the business pending before them. SECTION IV. The president of said board shall, at least once in each month, from the date of their first convention, report their proceedings to the Minister of the Interior _____the number of claims then pending before them ____ the number to that date confirmed or rejected, and the reasons for confirmation and rejection of any particular claim to land, with all the evidences adduced to and reduced before them. issued to those entitled to the same, upon the report which we are authorized to make, by the testimony to be presented to us. The board holds its stated meetings weekly at ____, in Honolulu, island of Oahu, to her the parties or their counsel, in defense of their claims; and is prepared, everyday, to receive in writing, the claims and evidences of title which parties may have to offer, at the _____, in Honolulu, between the hours of 9 o'clock A.M. and 3 o'clock P.M.
All persons are required to file with the board specifications of their claims to land, and to adduce the evidence upon which they claim title to any land in the Hawaiian Islands, before the expiration of two years from this date, or in default of so doing, they will after that time be forever barred of all right to recover the same, in the courts of justice. Date _____ day of _____ 20 ___. SECTION VI. The said board shall be in existence for the quieting of land titles during two years from the first publication of notice above required, and shall have power to subpoena and compel the attendance of witnesses by discretionary fine; in like manner when in session for the hearing of arguments, to punish for contempt; and they shall have power to administer oaths to witnesses, and to perpetuate testimony in any case depending before them, which, when so perpetuated, shall be valid evidence in any court of justice created by the act to organize the judiciary. SECTION VII. The decisions of said board shall be in accordance with the principles established by the civil code of this kingdom in regard to prescription, occupancy, fixtures, Kanaka Maoli (native) usages in regard to landed tenures, water privileges and rights of piscary, the rights of women, the rights of absentees, tenancy and sub tenancy---principle of gesture and rights of adoption; which decisions being of a majority in number of said board, shall be only subject to appeal to the Supreme Court, as prescribed in the act to organize the judiciary, and when such appeal shall not have been taken, they shall be final. SECTION VIII. All claims to land, as against the Hawaiian government, which are not presented to said board within the time, at the place and in the manner prescribed in the notice required to be given in the fifth section of this article, shall be deemed to be invalid, and shall be forever barred in law, unless the claimant be absent from this kingdom, and have no representative therein. SECTION IX. The Minister of the Interior shall issue patents, or leases to the claimants of lands pursuant to the terms in which the said board shall have confirmed their respective claims, upon being paid the terms in which the said board shall have confirmed their respective claims, upon being paid the fees of patenting or of leasing (as the case may be) prescribed in the third part of this act, unless the party entitled to a lease shall prefer to compound with the said minister as in the succeeding section allowed. SECTION X. 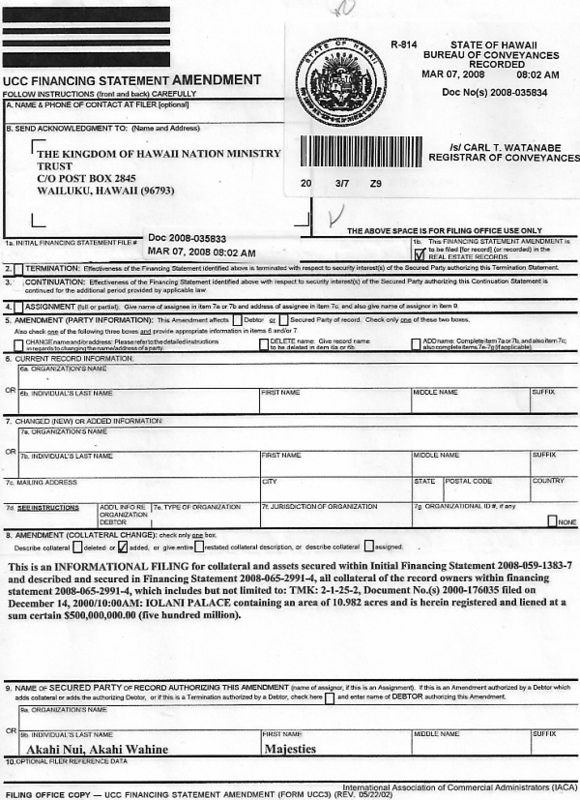 The Minister of the Interior shall have power in concurrence with the privy council, and under the sanction of His Majesty Akahi Nui, to issue to any lessee or tenant for life of lands so confirmed, being an Kanaka Maoli subject, a patent in fee simple for the same, upon payment of a commutation to be agreed upon by His Majesty Akahi Nui in privy council. SECTION XI. The patents and leases issued in accordance with the award of said commissioners, shall be recorded at the expense of the patentee or lessee, as prescribed in the third part, of this act, in a book to be kept for that purpose by the Minister of the Interior. SECTION XII. The said board shall not have power to entertain any claim to lands set up by any private person or persons until the claimant shall have deposited with the Minister of Finance a bond conditioned to defray the costs and expense incident to the proposed investigation, according to the rates of charge prescribed in the third part of t his act; which costs and expenses, shall after award rendered, be taxed by the president of said board, and a certificate thereof shall be given to the claimant, who shall exhibit the same to the Minister of Finance, whose certificate of full payment, together with the award of the commissioners, shall authorize the delivery of the awarded patent or lease to such confirmed claimant, by the Minister of the Interior, and not without. SECTION XIII. The titles of all lands claimed of the Kanaka Maoli government anterior to the passage of this act, upon being confirmed as aforesaid, in whole or in part by the Board of Commissioners, shall be deemed to be forever settled, as awarded by said board, unless appeal be taken to the Supreme Court, as already provided. And all claims rejected by said board, unless appeal be taken as aforesaid, shall be deemed to be forever barred and foreclosed, from the expiration of the time allowed for such appeal. SECTION I. The Minister of the Interior shall have power at the direction of His Majesty Akahi Nui in privy council, to issue patents to the inventors or improve of any machinery or other work of art, beneficial, in the estimation of His Majesty Akahi Nui, to the interests of his kingdom; and to grant to such inventors or improve, and to the authors of literary works, for any term of years to be designated in such patent. SECTION II. Said minister shall also have power, at the direction of His Majesty Akahi Nui in privy council, to issue charters of incorporation to any private body politic and corporate, calculated by its operations to benefit the government in any island division of this kingdom; and to confer upon such corporation all the privileges and powers of a person in law, for any term of time, to be limited in said charter, upon the terms and conditions to be therein expressed, reserving to His Majesty's Akahi Nui government the right of annulment, as prescribed in the act to organize the judiciary. SECTION III. Said minister shall have power to stipulate the compensation of all clerks and employees in his departure, to be paid by the Minister of Finance quarterly, upon audit, as in the third part of this act provided, and he shall have power upon the like contingency, to meet all the current and necessary outlays and disbursements thereof, without other limit than his ministerial and private accountability to the king Akahi Nui.